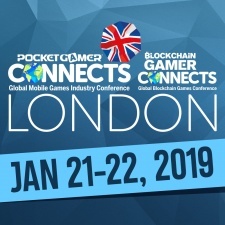 If you're planning to attend Pocket Gamer Connects London on January 21st and 22nd 2019, there will never be a more affordable time to buy your tickets than right now. To say thank you for believing in us and booking your tickets before we’ve even revealed a single speaker ahead of the event, our Super Early Bird prices offer a massive discount on the full ticket price. You could save up to $500 on every single ticket - just make sure to sign up before midnight next Friday, September 21st. We like to think that we’ve built up some goodwill ourselves with a track record over the last five years hosting Europe’s biggest B2B event for the mobile games industry. But don’t think we’re taking it easy. No sooner have we closed the doors on one fantastic Pocket Gamer Connects, bringing our 2018 world tour to a close in Helsinki, than we’ve already set our sights on making sure our 2019 debut is an absolute stormer when we return once more to London in the new year. We’ll release more event details in the weeks to come, but you can be sure that Pocket Gamer Connects London 2019 will once more present a world-class conference schedule featuring hundreds of the foremost authorities and biggest brands in gaming sharing their insights with the audience. You’ll also find the first Big Indie Pitch contests of the year, the Big Indie Zone, the UK premiere of side event, Blockchain Gamer Connects, and our traditional stonkingly good party - not to mention one or two surprises we’re cooking up right now. Sign up before Super Early Bird prices end next Friday, September 21st and save up to $500 as our way of saying thank you for believing in us. This is the absolute lowest cost of entry to the event and prices will only go up from here… book now! The only way your show tickets could cost any less, quite frankly, is if they were free! Which, curiously enough, is just one benefit to speaking at the event. Drop us a line using this form today to find out more. Up to $500 discount on Pocket Gamer Connects London ends today!